Parts of Longton town centre are closed off this evening as Staffordshire Fire and Rescue Service deal with a building fire on Caroline Street in the town. 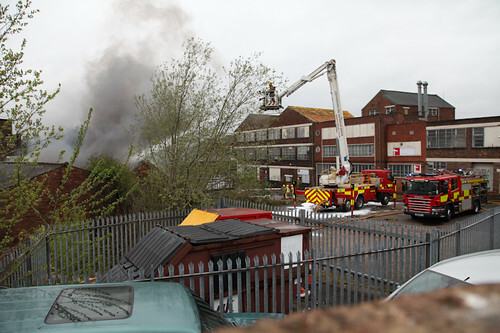 The fire service received a call to attend the building used by printing company Times Square Limited just after 15:45 this afternoon. 6 engines including the aerial platform and damage limitation unit were sent from Longton, Hanley, Cheadle & Ipstones stations. The incident is still ongoing with fire crews using foam as well as water jets. Staffordshire Police have closed off the following streets in the area as a safety precaution while the incident continues. One fire engine remains at Caroline Street this morning while fire investigation work is carried out. All roads apart from Caroline Street are now open as usual. This entry was posted in News and tagged Caroline Street, Fire, Longton, Pictures, Staffordshire Fire and Rescue Service, Stoke-on-Trent, Times Square Limited, TSL by Mike Rawlins. Bookmark the permalink.